Check out this hinge buying guide for expert advice on the most popular cabinet and furniture hinges, features, and FAQs. For Gadsden Hardware's complete collection, find over 250 cabinet and furniture hinges online. Purchasing and installing concealed hinges can be a little complicated if you’ve never used them before. That’s why we’ve included a brief, yet comprehensive guide to Blum concealed hinges called “Understanding Concealed Hinges." This guide should answer most of your questions regarding the basic types and applications of concealed hinges, as well as help you on your path to purchase and installation. If you need additional help, our customer representatives are "hinge experts" and welcome any questions you may have. Help is available by phone @ 1-800-383-0130 Monday through Friday 7:00 AM - 5:00 PM CST. Are your cabinets Face Frame or Frameless? Construction method that has a wood frame around the front of the cabinet box. Frameless (Box) Style Construction method that consists of a cabinet box with sides, top, bottom, and back. What are the most popular types of cabinet hinges? These hinges are totally hidden when installed. Originally designed in Europe for frameless cabinets you will now also find a full complement of face frame versions for almost any application. For overlay doors in face frame construction, you have two options for concealed hinges: Blum Compact series hinges, a more economical choice, or European style hinges with face frame adapter plates. 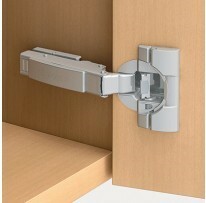 For more information on Blum Concealed Hinges, see our Blum Concealed Hinge Guide! (Downloadable PDF). 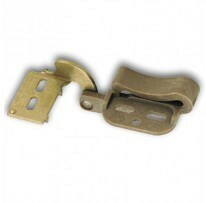 These are a particular type of concealed hinge that uses a hole bored into the back of the cabinet door. Sometimes called knife hinges, a small 9/32” slot or kerf is cut in the top and bottom on the hinge side of your cabinet doors and all you see is small knuckle on the edge of the door. These hinges are attached with screws to the surface of a face frame style cabinet. 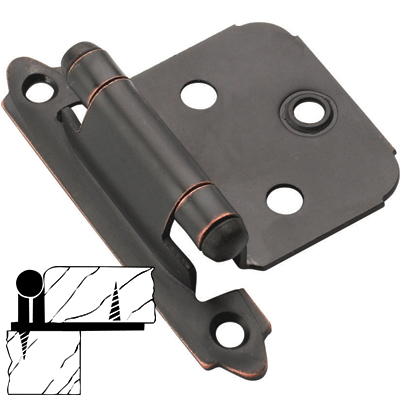 These hinges can be full or half wrap and are attached with screws to the inside edge of a face frame opening. 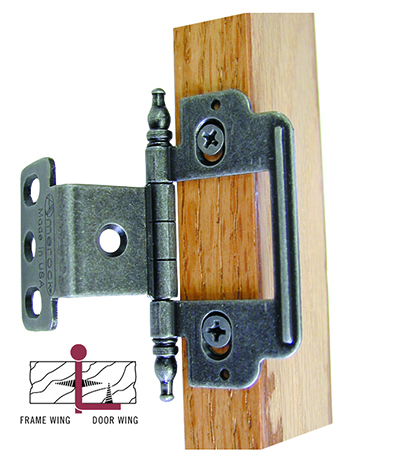 Wrap hinges are available in residential, furniture and heavy duty institutional versions. 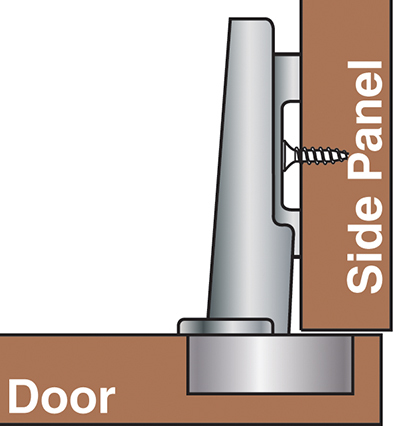 Mortise hinges are installed in a mortised opening on edge of the door and the edge of the face frame and are concealed or hidden when closed. These hinges do not have any type closing mechanism and are commonly used with touch latches which pop your door open when lightly pressed and also mechanically or magnetically hold the door in the closed position. Shop Free Swing Cabinet Hinges! As the hinges get close to be being shut, the self close mechanism will grab the door and pull it closed, this also helps to keep the doors shut so they don't creep open. Also known as Stay-Close. 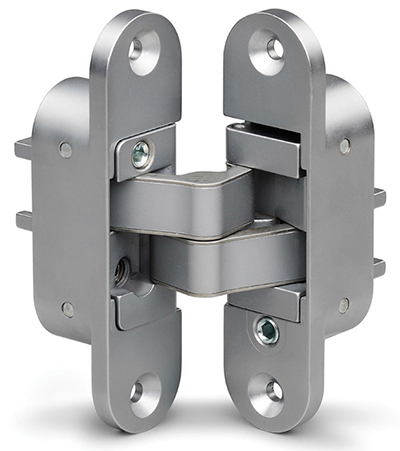 Soft-close devices can be added to most hinges, including self closing hinges. 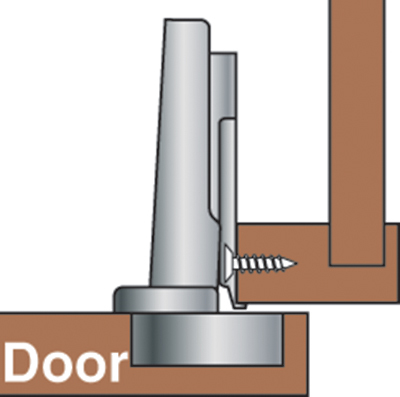 Dampeners in the hinge will slow the door down and pull it fully closed. Same with drawer slides, cabinet doors using soft close hinges prevent slamming and minimize noise. Shop Soft Close Cabinet Hinges! Need additional guidance? Feel free to email or call our hardware experts for more information.